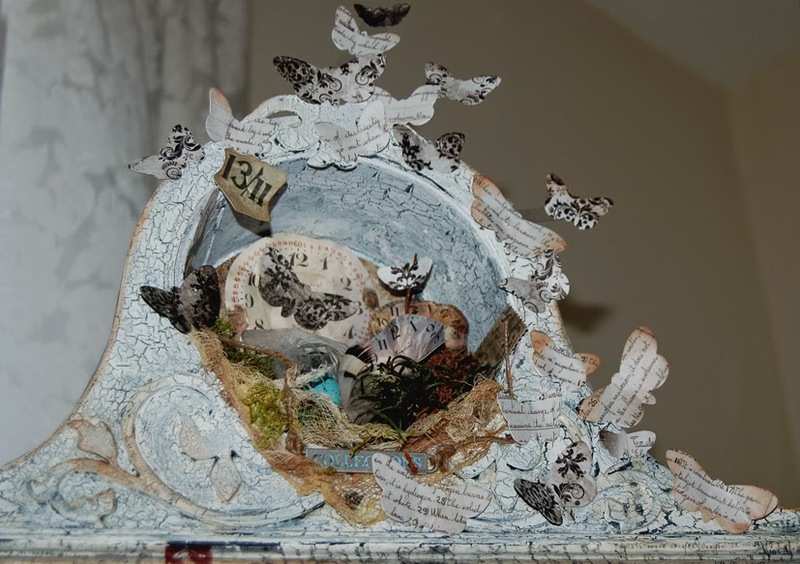 Zuzu's Petals 'n' Stuff: Time Flies at "A Vintage Journey"..... guest designer spot. Time Flies at "A Vintage Journey"..... guest designer spot. Hi there folks. I was very happy to have been asked along to "A Vintage Journey" as a guest designer this month. The theme is "Time Flies". 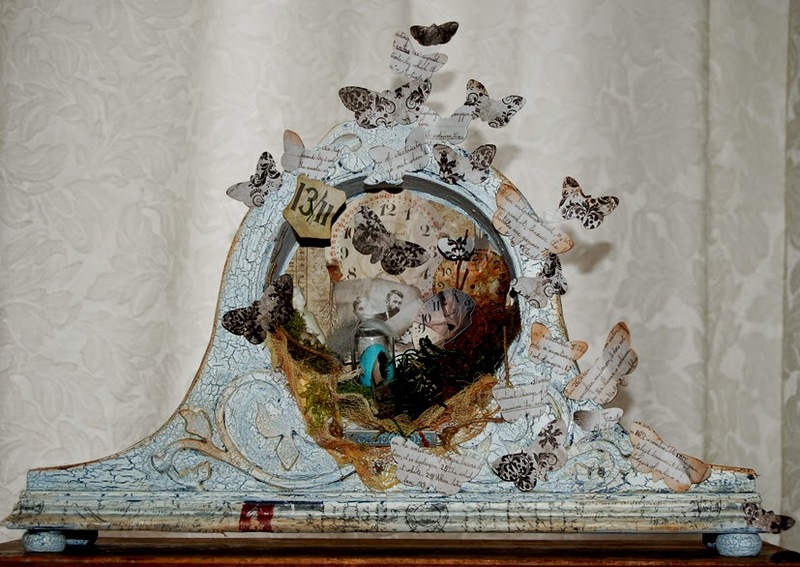 I have combined my love of "DecoArt mixed media" and "Tim Holtz prodcts" by altering this old clock case i managed to find in an antique shop for less than a fiver!. I painted it with a charcoal coloured chalky finish paint (relic) , gave it a coat of the crackle medium for chalky paints then gave it a coat of white chalky finish paint (Everlasting) and sealed it with a couple of coats of creme wax . I used some tissue tape to decorate the bottom of the clock case and around the the top. Next i cut out lots of butterflies using my Tim Holts Framlets dies and some paper from the "laboratories" papers and attached them randomly around the case. i used acetate to attach some so it looked like they were flying free of the clock case. 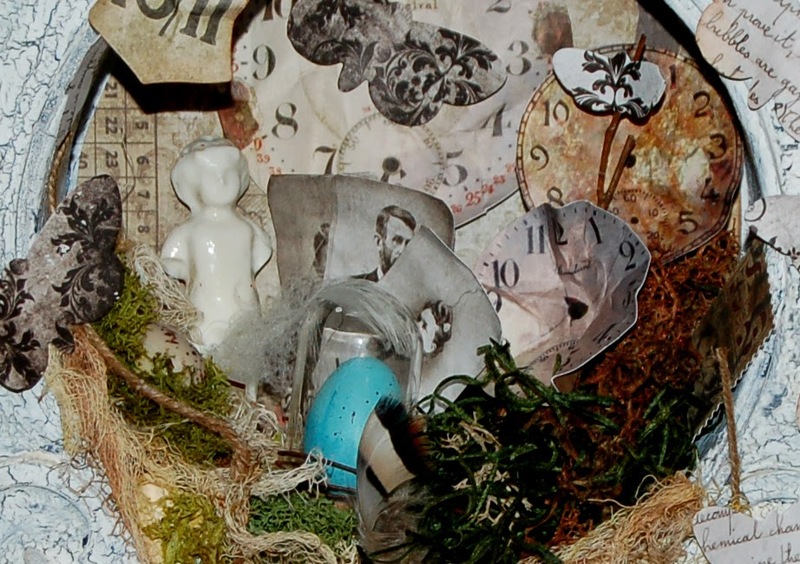 I cut out a circle of "wallflower" paper to stick to the back wall of the display area then all I had to do was stuff it full of moss, eggs and a handful of wonderful Tim Holtz ideology and ephemera. Please do go over and take a look at "A Vintage journey". 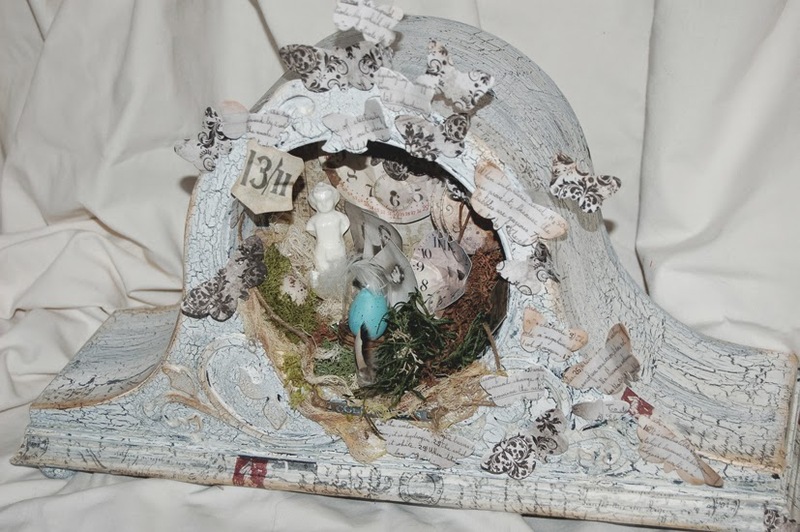 its a Tim Holtz inspired blog challenge full of amazing and varied inspiration. Fabulous piece Z, love what you did and such a great make (and idea) or the current challenge! Your clock looks so very beautiful, Zuzu! And what a great idea! Really a fab piece!! An absolutely glorious creation - thank you so much for guesting with all your usual vintage textured beautiful genius!